Home Mammals Carnivorous Mammals When Do Raccoons Have Babies? How Many Babies Do They Have? These bandit-masked animals are known for their dexterous front paws, bushy ringed tail and of course, their mischievous-looking face. They are excellent climbers and can easily scramble up trees, fences, brick walls and almost anything with uneven surface. Because they are nocturnal mammals, they do not usually come out during the day as they go to sleep in daytime. They may go into a sort of deep-sleep during winter, which is not true hibernation. Now the question arises when do raccoons have babies and also, how many babies do raccoons have? As for baby raccoons, they are cuddly and fuzzy little creatures. 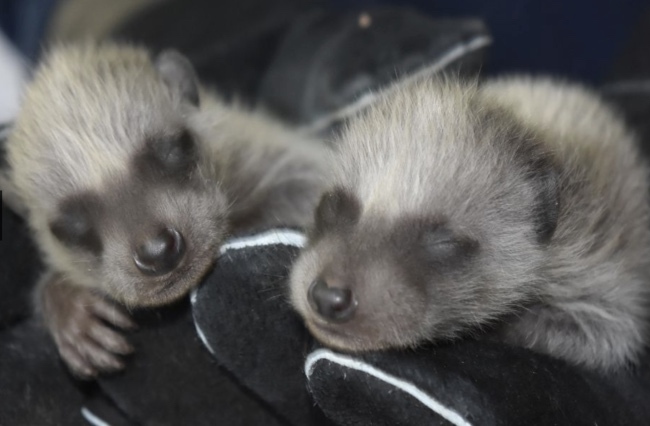 They are known as kits or cubs and are born blind and deaf. However, after about 12-14 days, they may open their eyes and see the world for the very first time. Similarly, after few days from getting their eyes open, the kits start hearing. At birth, the kits are about 4 inches in length and weigh around 60 to 75 grams. Mating season of raccoons begins in January and continues until March. After a wait of about two months, a female raccoon gives birth to her babies. As the season arrives, the male raccoon seeks females in its surroundings and it roams around constantly. As soon as males are able to find females, copulation begins. This copulation can go on for about an hour and this activity continues for several nights. In a social grouping, there are some weak male raccoons as well. When a number of female raccoons arrive for mating, these weak members also take advantage of this occasion. This is because stronger male raccoons are unable to mate with every female. In fact during one study, the scientists revealed that more than half of all female raccoons usually mate with more than one male raccoon. If a female raccoon fails to become pregnant or for some reason loses her kits, she will be able to conceive young again after about 80 to 140 days. A Raccoon Out During the Day? How Many Babies Do Raccoons Have? As mating ends, a female raccoon gets pregnant for about two months. After this period, she bears four to six young. Depending upon the particular type of habitat, a litter size may vary and it can consists of 2 to 4 young. Within a period of four to six weeks, a baby raccoon can stand on its feet. After about 70 days, the kits are weaned. They will be able to hunt on their own after 9-12 weeks. By this time, they weigh around 2 pounds and are going to taste solid food for the very first time. In their first few days after getting out of den, mother raccoon gives hunting and climbing lessons to her cubs. She would grab them by her neck, carry them around and looks after the predators that may pose danger for her young. The young raccoons would not leave their mother for about one year.